As we reported this morning, astute iPod owners with iTunes 12.2 have discovered an image that depicts the iPod touch, nano, and shuffle in new colors, suggesting an update could be in the works. A bit more digging around in iTunes 12.2 has unearthed additional iPod images, giving us a look at each of the new color options we might see should Apple be planning to release new models. 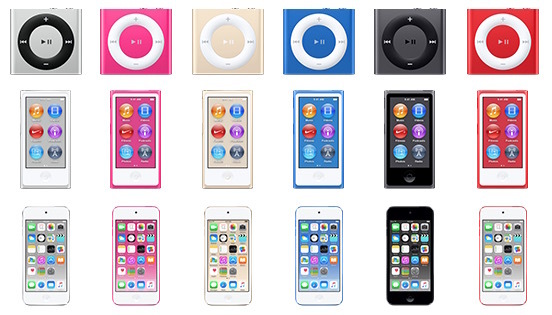 The images depict six different color options for the iPod nano, shuffle, and touch, showing each model in silver, space gray, red, bright pink, deep blue, and light gold. The latter three colors, pink, blue, and gold, are new shades that are not currently available. The space gray model may be slightly darker than the existing color, but it's difficult to determine from images alone. Aside from new color options, the devices appear to be largely the same, except perhaps for an external change for the iPod touch that does away with the attachment for the wrist loop. It is not clear if Apple plans to update the internals of the devices or if the company is simply going to introduce new color options, but the images make it clear that a potential update is not going to feature a major external redesign. Apple's iPod lineup has not seen new color additions since 2013, due to a sharp decline in sales over the past several years. The last update saw Apple change the "slate" color to "space gray" in September of 2013, and no major color changes have been made since that date. The Calendar app on the iPod touch in the images reads "Tuesday 14," leading some of our readers to speculate that Apple might plan to introduce new models on Tuesday, July 14, which is two weeks from now. Sigh, that's a color lineup? The first thought that came to mind was, "Ew, fugly, ew." Remember this? Those were the days. It'd put you in a dilemma as to which one to pick. This lineup makes me wanna count which ones not to choose. Here's to [S]praying[/S] hoping it's more than a cosmetic update! I'd buy an updated touch in a heartbeat. Not everyone owns a smart-phone. ;) And, these are still a better solution if you have tons of mp3s that you want to listen to all the time. I thought those were beautiful; at the very least, the blue in this rumor is closer to that of the iPod nano chromatic. Fingers crossed for some internal updates for the Touch. A5 doesn't cope with 2015's software very well. The colour options look familiar. I just hope they do update the iPod touch's internals. It's ridiculous that it still has an A5 chip, and will cut it off from being able to run even more apps launched in September, which can now demand that they run on a 64-bit processor. I still use my iPod Shuffle a lot. It's great when I'm outside working. If they do update them, I'll probably pick one up. Well, you see, s/he doesn't need an iPod anymore so s/he thinks no one should be given the option even if they do.